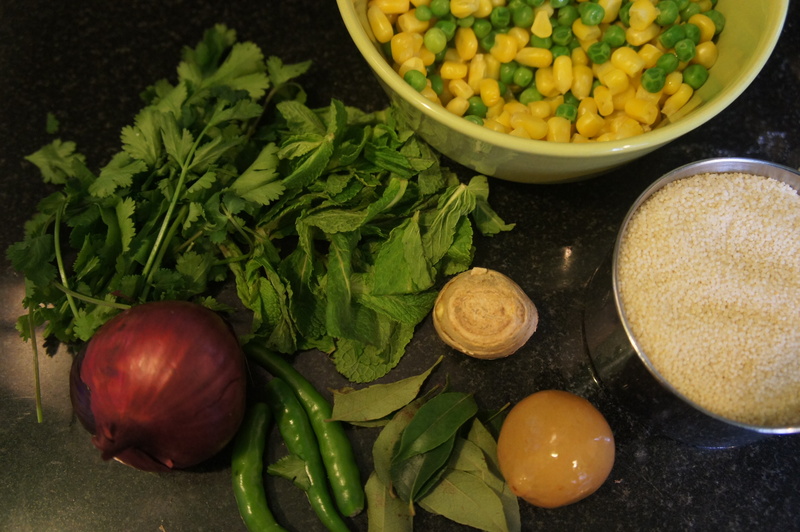 Upma | Life's Conundrum - Eat to Live or Live to Eat? With the kids on half term break a couple of weeks back we have not managed to post any recipes. The weather also appears to have turned for the better after a couple of months of incessant rain – thus allowing us to begin cleaning our backyard and prepare it for some vegetables and herbs. 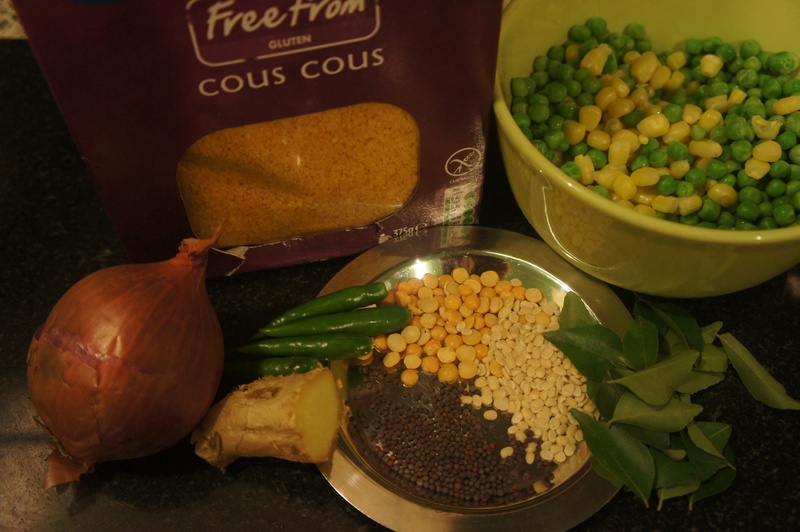 We posted a recipe for a gluten free alternative to semolina upma using corn cous cous – we made it again and this time decided to add a teaspoon of Ras al-Hanout powder, a teaspoon of harissa paste and a preserved lemon which was coarsely chopped (added after the onions were sauteed and cooked for a couple of minutes to ensure the raw smell of the spice mix disappears). 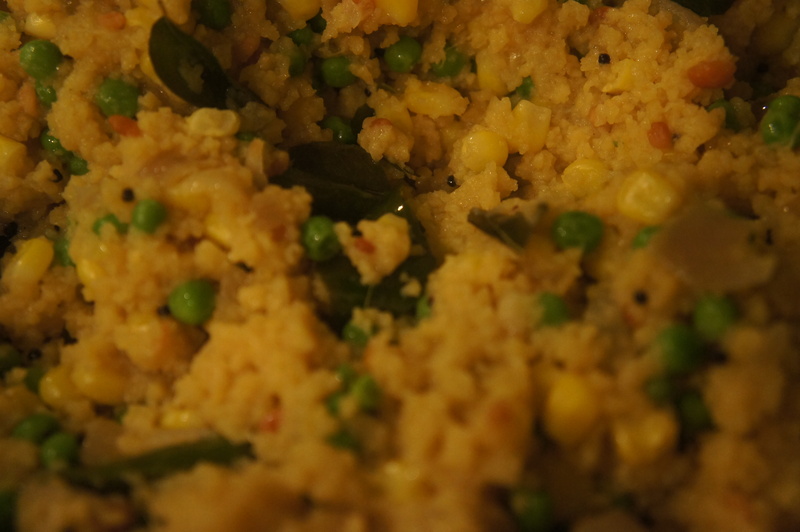 The flavours worked beautifully and the addition of the preserved lemons added a new dimension to the upma. 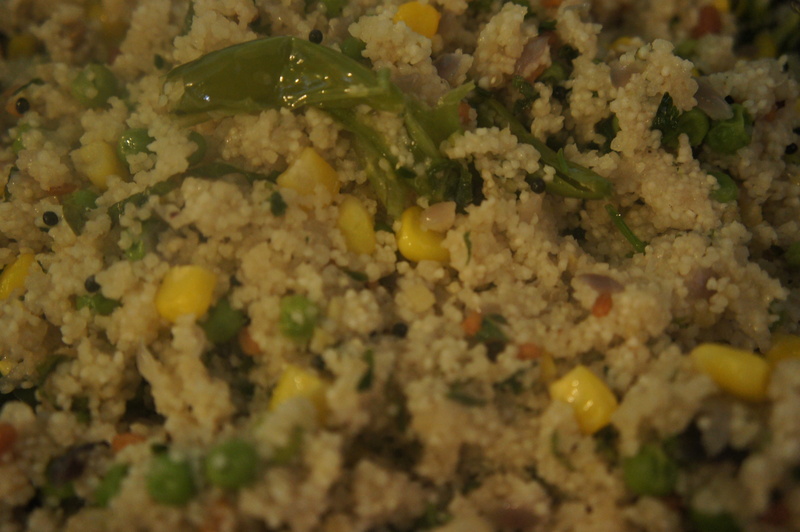 We are now inspired to experiment with other ethnic flavours to make our upma more interesting. On one of our past trips to ASDA we came across some cous cous made from maize semolina which we have been meaning to experiment with. Tonight we made an upma (generally made with wheat semolina) with it which tasted remarkably like normal upma but without any of the gluten. It is safe to say based on tonight’s experiment that this ingredient is definitely going to be a part of our cupboard essentials for quick meals in the future. Heat a wok on medium heat with some ghee in it and saute the mustard seeds, urad and channa dahl till the mustard seeds start to splutter. Then add the ginger, curry leaves and green chillies. Saute for 30 seconds before adding the chopped onions. Sprinkle a bit of salt to taste and cook the onions till they go translucent. 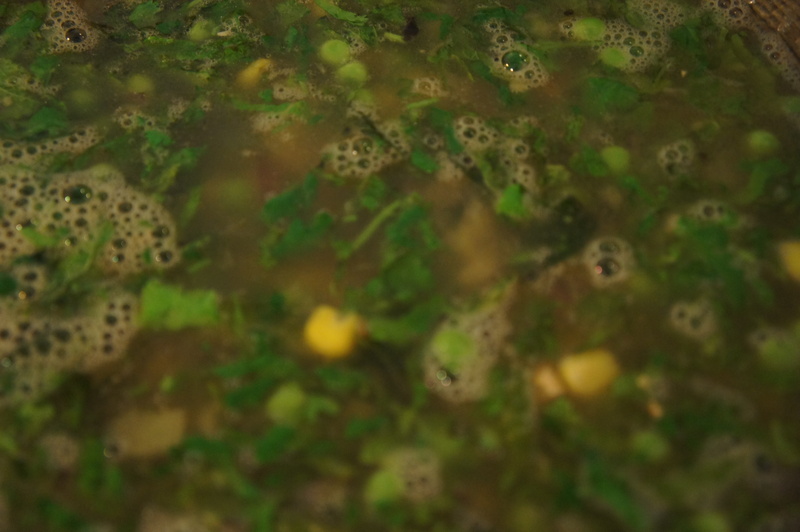 Add the microwaved corn and peas to the wok with 300 ml of boiling water. Allow the dish to come to a boil before pouring in the cous cous. 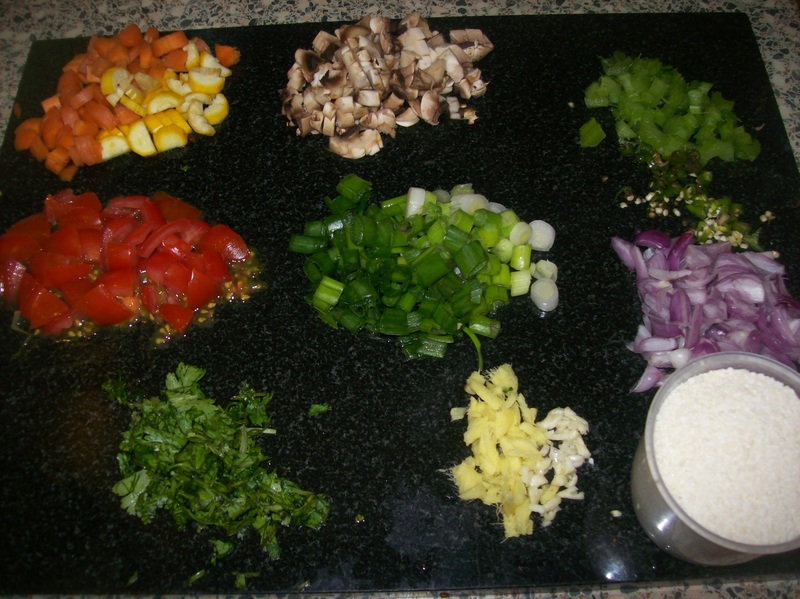 Give the dish a good mixe, place a lid over the wok and switch off the heat. Wait for 5 minutes for the cous cous to absorb the water. Once done fork through the dish to fluff up the cous cous and enjoy hot. 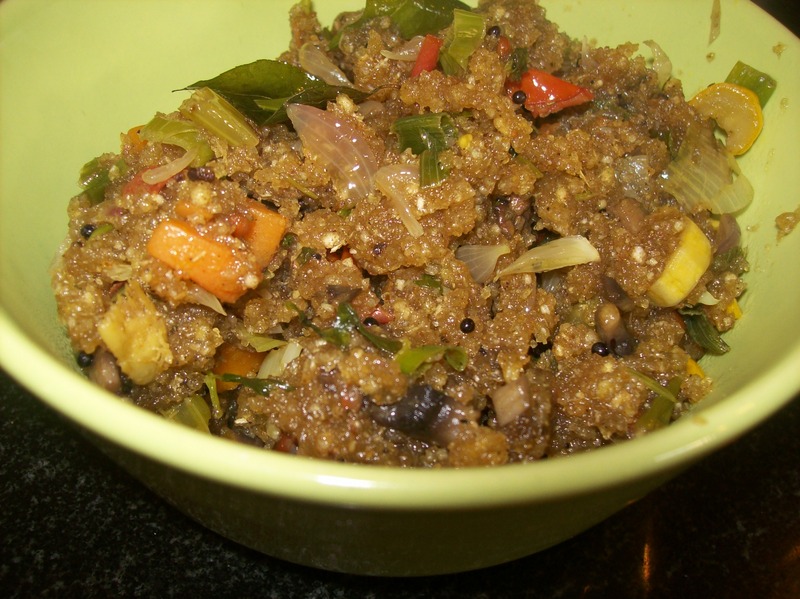 Upma is a simple traditional South Indian breakfast and tiffin dish which is normally made of coarse or fine semolina. 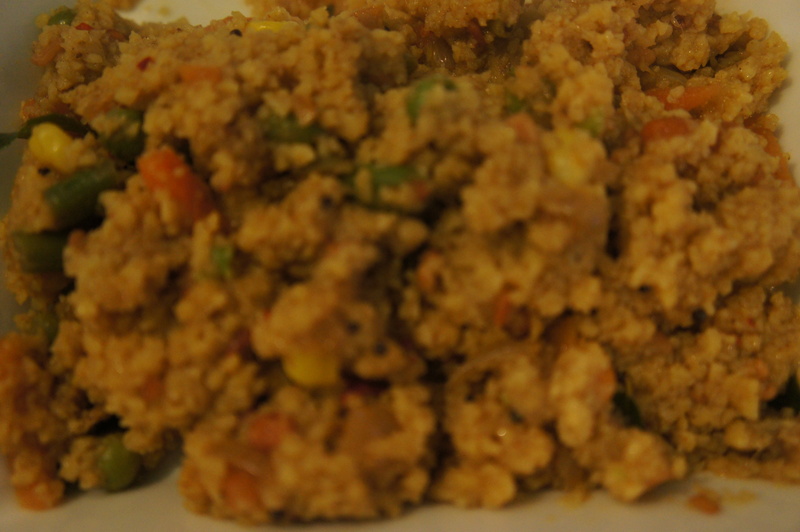 Since getting on the Paleo journey Anna and I have abstained from eating upma as its made from a wheat derivative. On one of our recent shopping trips to an Asian grocery store Anna spotted some cassava powder (gari) which resembled broken wheat in texture and picked it up. Last night was a voyage of discovery and we think we have found a suitable alternative to semolina and cannot wait to make some of our traditional breakfast fare and sweet dishes that we have avoided off late. Heat pan and add 2 tbsp of ghee before adding the mustard seeds. Once the seeds start crackling add the urad dahl and stir till they turn golden brown. 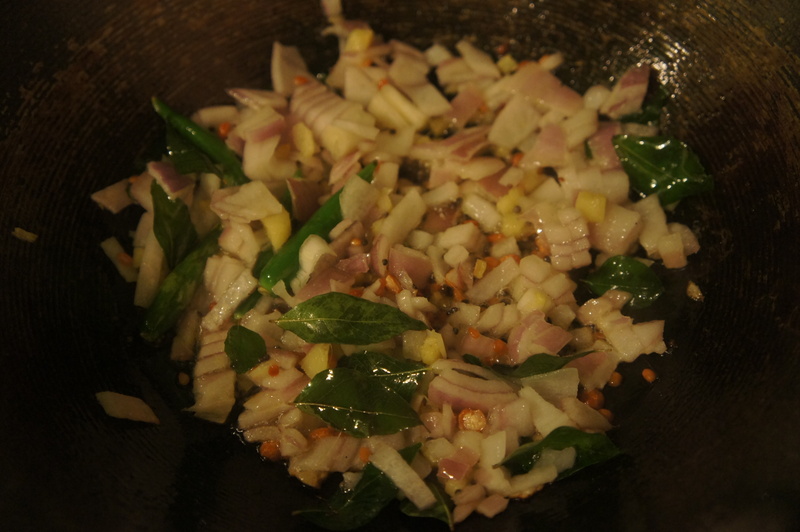 Add the curry leaves, ginger and garlic and cook for a couple of minutes. Then add each of the vegetables in sequence giving each a couple of minutes to cook before adding the next (first the onions and celery, then the carrot and courgette followed by the mushrooms and finished off with the spring onions and chopped coriander. Next add the turmeric powder, garam masala and salt and mix for a couple of minutes. Add 250 ml of water and bring to a boil and cook on medium heat for 5 minutes. 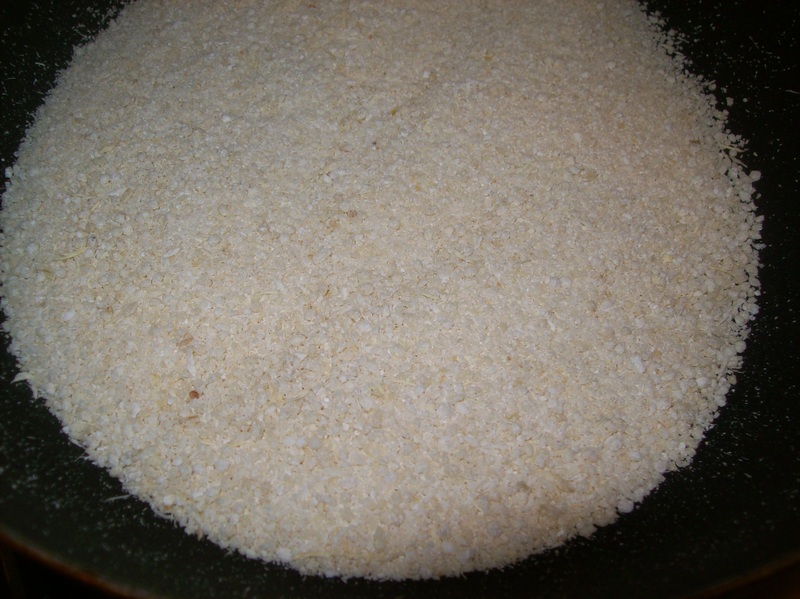 Finally add the roasted cassava powder to the pan while mixing it vigorously to avoid clumps forming. Cook for 5 minutes while constantly stirring and then remove off heat. Serve hot with a fresh coconut chutney.